Can additive gains help future-proof farms? With the need to maximise milk and meat from forage, has the case for using an additive become more compelling? Independent silage consultant Dr David Davies is unequivocal in his view about making an additive an integral part of good silage-making. I think farmers should be using an additive on the vast majority of silage, he says. His reason? Fundamentally, to improve the quality of the fermentation, which then brings other benefits. That said, with so many treatments available, he insists the additive should come with clear proof. And proof on two levels. Firstly, proof it works in UK conditions: he questions the relevance of relying solely on overseas results obtained on high dry matter grass which is easier to ferment but more difficult to make in the UK. And secondly, proof that treating with the additive can actually improve animal performance. Farmers faced with lots of different additives to choose from simply turn off,” he says. “The choice should be based on trials conducted under conditions that mimic the weather and crops of the UK, that prove reduction in dry matter losses and animal performance responses. Although in theory, fermentation happens naturally when grass is ensiled, due to naturally-occurring bacteria on the crop, David says the reason for using a proven additive is because some of those bacteria won’t necessarily be the best types to carry out the fermentation efficiently, and some could be very much the wrong types. “Put simply, you need to direct the fermentation because you can’t guarantee what microbes are present. “To use an analogy, when milk is processed it is sterilised first. But grass isn’t sterilised when it goes in the clamp. If you use the right additive, you will improve sugar content and reduce true protein degradation in the silage. “In the animal, the most inefficient part of rumen fermentation occurs because of low sugar and because protein has been broken down. If you improve these two, you will get an animal performance benefit,” he adds. Philip Jones, silage microbiologist for British-based additive manufacturer, Volac, agrees. He believes a key reason some farmers remain sceptical about additive use is a lack of awareness and belief in exactly what they do in the clamp. “Fermentation is simply a form of pickling,” says Philip. “An efficient fermentation occurs when good bacteria convert some of the sugars in the forage into beneficial acid, which in turn preserves the forage against undesirable microbes, such as enterobacteria and clostridia. Applying a quality additive essentially provides an avalanche of specially-selected good bacteria – as many as 1 million per gram of forage when used correctly. So it puts you in greater control of the fermentation process. Without this, you’re leaving fermentation to chance. If silage is fed for half the year, that’s a big risk. 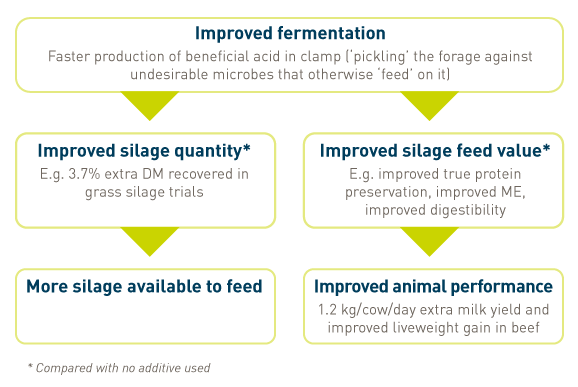 Pointing to Lactobacillus plantarum MTD/1, the bacterium used in Ecosyl, Philip says there is now a huge amount of research to pinpoint the logical sequence of benefits that treatment brings – from application right through to animal performance (see graphic). First among these, he says, is improved fermentation efficiency. “There’s a much faster production of beneficial acidic conditions in the first 24 hours after ensiling with treatment than without. That’s an important timescale for stopping bad bugs getting established,” he confirms. Following this, he says, are increases in silage quantity and quality. “In grass trials, over 95% of the original dry matter ensiled was retained with treatment – 3.7% more than without treatment. 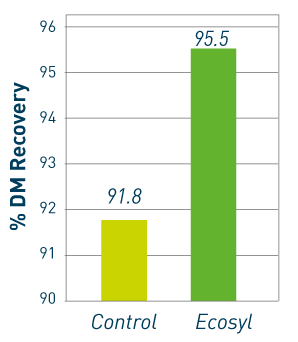 From a quality perspective, Ecosyl treatment has also been shown to boost average ME by 0.6 MJ/kgDM, to preserve more true protein, and to improve digestibility by an extra 3 D units. Explore the Ecosyl website to find out more about the Volac range of Ecosyl silage additives. According to David Davies, by making high quality silage, more of the animal’s nutritional requirements can be met from home-produced forage. This can reduce concentrate use and milk production costs, and maintain a healthier rumen, so reducing metabolic disease – all in all making profitable milk production far more likely, he adds. Older PostDairy Farmers- GRASS SILAGE SURVEY 2018/19- Grab Yourself a Free Gift!